Tuberose absolute is one of the most precious oils in the world and is renowned for its captivating aroma and fragrance, it is also one of the most expensive natural oils available. Tuberose is used more in perfumery than in aromatherapy. It acts as an aphrodisiac to treat impotence & frigidity. Specific components in this oil stimulate the part of the brain responsible for libido & arousal. Its warming effect increases blood circulation throughout the body. Tuberose Absolute is one of the high vibrational and mystical oils, similar to Jasmine sambac and White Ginger Lily. 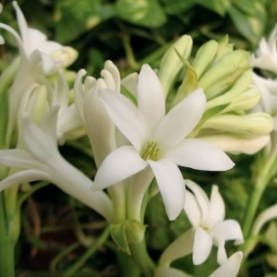 Tuberose is also known as "Night Queen" and "Mistress of the Night". It is considered an aphrodisiac as it has a very intense and intoxicating floral fragrance that fills the air and creates an atmosphere of love. It has been very effective in treating frigidity and lack of libido. The reason for this is that certain aromatic components of Tuberose absolute stimulate parts of the brain which are responsible for arousals, sexual feelings and libido. It also relaxes the mind and relieves tension. It has a warming effect on the organs, as it increases circulation of blood. A tall, slim, tender perennial that grows to about 50cm tall. It long slender leaves, tuberous roots and very aromatic white flowers. It is related to Narcissus and Jonquil. Some varieties are grown for Because it only blooms at night, it has come to be known as “Night Queen”, “Mistress of the Night”, or “Raat ki Raani”, as it known in Hindi. Aztec healers referred to it as “omixochitl” meaning “bone-flower” due to the appearance of the luminous white, waxy flowers. Brings about relaxation. A great oil to use for meditation. Helps create a positive mood, while exuding a vibrant, happy sweetness. Aphrodisiac, sedative. In Ayurvedic tradition, tuberose is also known to stimulate creativity and psychic powers. It is said to increase the capacity for emotional depth by opening the crown chakra. Tuberose is also believed to increase artistic inspiration as it stimulates creativity and brings serenity to the mind and heart. Sensuality, expressiveness & enthusiasm. May contain methyl eugenol, moderate risk for skin sensitization.